The Swiss healthcare system makes an important contribution to employment and prosperity in Switzerland. At the same time, the sector is facing major challenges as a result of the huge rise in costs. The economists of Credit Suisse have subjected the Swiss healthcare system and the most pressing questions it currently faces to intense scrutiny. The Swiss healthcare system makes an important contribution to employment and prosperity in Switzerland. Some CHF 70 billion – or more than 10 percent of annual economic output – is spent on healthcare in Switzerland every year, and one worker in every ten is employed in this area. The further development of this sector will therefore also have a decisive impact on Switzerland's economic future. However, in the last few years in particular, the observed increase in costs has been posing major challenges for the healthcare system: Healthcare costs in Switzerland have risen by a good third within the last decade. Contrary to widespread assumptions, it is not demographic aging that is primarily responsible for this rise in costs, but other factors such as medical advances, greater individual consumption of healthcare services, and misplaced incentives within the system itself, as the Credit Suisse economists show in the latest edition of their study "Monitor Schweiz". According to Credit Suisse economists, healthcare costs can be expected to rise by more than 3 percent annually between now and 2040. By then Switzerland is likely to be spending just under 15 percent of its economic output on healthcare – compared to 11 percent today. "In this scenario, average health insurance premiums per capita will virtually double," observes Andreas Christen, principal author of the study. Expressed in francs, the average monthly premium for mandatory health insurance could rise from CHF 274 in 2015 to CHF 517 by 2040. After adjusting for general inflation, this equates to a rise of 44 percent. Parallel to the increase in costs, the requirement for specialist personnel is also on the rise. The Credit Suisse economists predict that an additional 185,000 full-time equivalents will be required in the Swiss healthcare system by 2040, which represents a rise of some 50 percent on today's workforce of 360,000. However, this figure will be different if a greater degree of automation can be achieved: According to the calculations of the study's authors, some 23 percent of healthcare activities can be described as routine activities, and therefore at least theoretically lend themselves to automation, such as in the context of progressive digitalization. 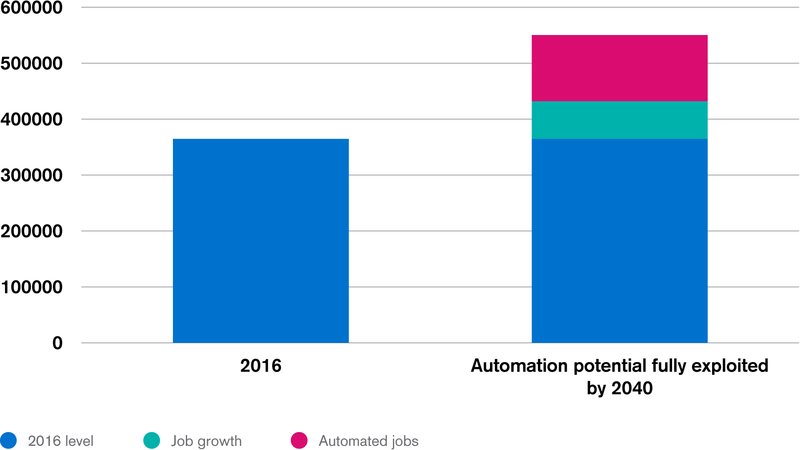 In the event that complete automation of these activities occurs, the additional requirement for specialist personnel would rise by just 67,000 by 2040. However, full exploitation of the theoretical potential for automation is not considered to be a realistic scenario by the study's authors. According to the latest sources available, some CHF 16 billion of hospital construction work is planned in Switzerland. Many of today's hospital buildings are in need of renovation, as they were constructed in the 1960s, 1970s, or 1980s, which means that investment is required to bring these buildings into line with modern requirements. However, fears are being expressed in the public debate on this issue that the construction boom could lead to excess capacity and financing shortfalls. The Credit Suisse economists show that the number of inpatients treated across Switzerland will rise by 25 percent by 2030, thereby in principle increasing demand for hospital infrastructure. However, the rise in the number of hospital beds is expected to be much smaller as a result of the reduced length of hospital stays, outsourcing to the outpatient area, and superior bed utilization. A significant proportion of the planned investment in Swiss hospital buildings has yet to be financially secured. "As things stand, only around a quarter of hospitals generate a sufficiently high profit to ensure the sustainable financing of their infrastructure," explains Andreas Christen. However, he does not believe that a large number of hospitals will have to close in the long term as a result of this problem. It is much more likely that certain cantons will intervene in the market – contrary to the intention of the new Hospital Financing Act of 2012 – and provide further support. For this reason, as well as to meet the rising costs of healthcare, hospitals will have to tap into new sources of financing. "For public hospitals, for example, raising funds via the financial markets is attractive in view of the low-interest environment," points out Didier Denat, Head of Corporate & Investment Banking for Credit Suisse in Switzerland. "This type of financing can make a real contribution to financial transparency and therefore to increasing efficiency in the healthcare system." According to the Credit Suisse economists, one of the fastest-growing sub-areas of the healthcare system is that of medical centers. These represent an attractive alternative to the traditional individual practice not just for patients, but also for many doctors. For example, while patients benefit from longer opening hours, doctors benefit from more flexible working hours as well as better utilization of medical equipment. According to the calculations of Credit Suisse economists, the number of medical centers increased by 19 percent to 1,300 between 2011 and 2014. In absolute terms, growth was strongest in major urban centers, but relative to the existing base it was particularly dynamic in suburban and peripheral areas. According to the study's authors, this is likely attributable to the fact that Switzerland's urban centers have a comparatively large number of medical centers already, and the process of practice consolidation is therefore likely to be well advanced. The overall number of medical centers is likely to rise further, as many older doctors are set to retire over the next few years, and younger doctors have a clear preference for the group practice model.